While MyPCBackup offers a diverse range of features, beware of hidden costs! If you don’t mind paying out for some added extras, however, it’s got plenty to offer. You can read a detailed review below or sign up now. There are plenty of options available for MyPCBackup users, with three subscriptions and the option to pay for a month, six months, a year or two years at a time. To save our American readers the trouble of converting the prices to USD (and avoid swamping you with too much info), we’ve done the math for yearly accounts – though please note that they may vary slightly depending on conversion rates at the time of buying. All fees are also subject to VAT, charged at your local rate. MyPCBackup often runs promotional discounts, so you can save a little extra by signing up at the right time. Signing up with MyPCBackup will give you instant access to a 1GB free account, including a 15MB sync folder. You won’t need to hand over any bank details to get started, and if you upgrade your existing files will remain intact. For a little extra, you can also perform some basic tasks to qualify for up to 250MB of Free Bonus Space. MyPCBackup also promises to refund you for the remainder of your subscription term if you cancel at any time, no questions asked. Unfortunately, a bit more research reveals that they reserve the right to charge termination fees, although specific figures are not given. Money-back guarantees also can’t be applied to the majority of add-on services, which make up a large part of the MyPCBackup service (see below). In addition to paying for your basic plan, you’ll also need to cash out if you want to use any extra features. While the MyPCBackup site does contain a price list for these services, it’s unfortunately completely out of date, with very few of the charges displayed reflective of what it would cost you to sign up for the add-ons today. Never fear though – we did some investigating, and can now guarantee that all of the prices listed in this review are 100% accurate. While all add-ons are optional, if you’re looking for anything more than basic functionality, you’ll want to opt in for most of them – leaving the total cost of using MyPCBackup considerably higher than their advertised subscription prices. What’s more, add-ons can’t be refunded, and can only be purchased annually, meaning that you’ll have to pay out a lump sum to get yourself set up. While paying for services the majority of providers offer for free is off-putting, what’s worse is the fact that prices are not clearly illustrated on the MyPCBackup website. For example, reading through the Features page suggests that unlimited file versioning is automatically part of any subscription although, in reality, you’ll have to pay a yearly fee of $49.95 for the privilege, or settle for only the seven most recent versions as part of a standard plan. While the additional charges are listed on their pricing page, information on features assumes that you’ll be paying for all of the added extras – so make sure that you cross-reference all subscription details before signing up. How does MyPCBackup compare to the competition? On average, most Cloud storage subscriptions start at between $7 and $12 per month, placing MyPCBackup’s Pro and Premium plans well within the normal range – although many other providers offer more storage space for the price. If you want to use any of MyPCBackup’s add-on services, however, the price starts climbing, leaving the cost of paying up for a full range of features significantly higher than you’d expect from almost any other provider. Cloud storage.With limited storage space and an emphasis on syncing and sharing files, MyPCBackup is probably best classified as Cloud storage, although automatic and scheduled backups bridge the gap with online backups a little. For more information on both types of storage, head over to our Ultimate Backup Guide! It isn’t easy to find information about MyPCBackup or its founders online – they’re conspicuously absent from Wikipedia, and there’s no ‘About Us’ info on their website. After a bit of digging, we discovered that they’re owned by JDI Backup Ltd; a kind of backup conglomerate that also owns JustCloud, ZipCloud, and BackupGenie. Based in the UK, JDI Backup was founded in 2011 by Nick Baker, the company’s current CMO, and Brooke Bryan, who retains the position of CTO. Further poking around online revealed that JDI Backup is a branch of Just Develop It – a fairly massive parent company that’s involved in dozens of ventures including web hosting, real estate, social account management and childrenswear. 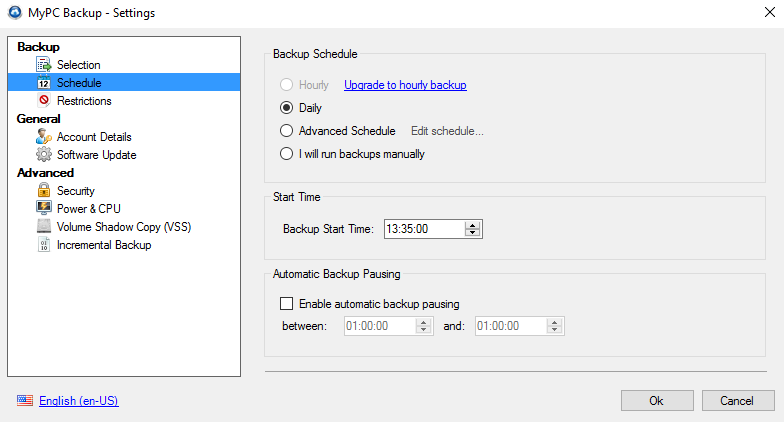 MyPCBackup’s range of backup options is pretty impressive, as not many services let you choose between automated, scheduled and manual backups. When it comes to picking backup times, you’ll have the freedom to select days, weeks and months; although if you want to set a specific time, you’ll need to cough up $19.95 per year for the Hourly Backups add-on. While MyPCBackup’s website claims that you can upload any file you like, there are restrictions. With a standard backup plan, you’ll be able to upload files of up to 1GB, though trials only accommodate a maximum of 5MB. Also, while uploads of music, images, emails, MS Office documents and PDFs are all supported, video files up to 10GB in size can only be manually backed up. If you’d like to include them in automated or scheduled uploads, you’ll need to buy the Automatic Video Backup add-on for a yearly fee of $14.95. MyPCBackup lets you share files in several different ways; by posting public links for anyone to access, or by sending invitations to individual friends, clients or colleagues to view or edit your documents. If you change your mind, you can easily disable links or withdraw access to your content. 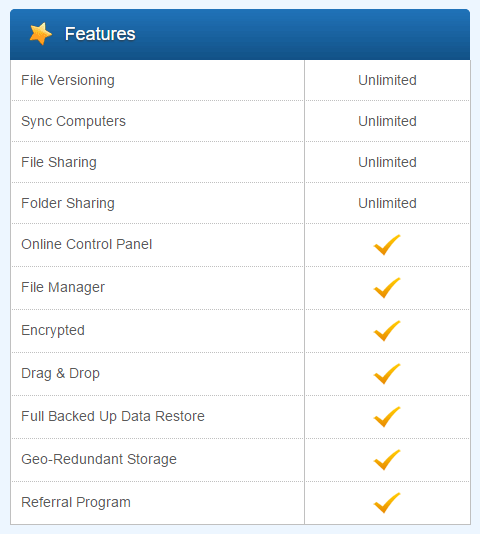 When you sign up with MyPCBackup, you’ll get a single license which can be used to upload files from one computer at a time. While this license is transferable, you’ll need to cancel its registration to your original device before you can set it up on a new one, making the whole process fairly laborious, and also preventing you from ever backing up files from two devices simultaneously. It’s not all bad, however – files saved in your sync folder can be accessed and restored from any number of devices, regardless of whether they have a license or not, and you can upload files from mobiles and iPhones completely free of charge. You can also choose to purchase additional licenses for $29.95 each per year. All of your files can be synchronized by using MyPCBackup Sync folders, which act as a central storage space for you to keep all of the files that you might want to share between devices. You won’t get unlimited sync space automatically, however – free accounts get just 15MB, while paid subscriptions have a 1GB limit and, guess what? There are add-ons too! If you’d like more space, you can contact MyPCBackup directly and they’ll give you a quote for your preferred amount. When it comes to file versioning, the default setting for paid subscriptions is to store the seven most recent versions of your data. If you’re looking for a little more, you can sign up for the Previous Versions add-on, which gives you access to all file versions from the past 30 days for $24.95. Alternatively, unlimited version history is available courtesy of the Previous Versions Plus add-on, which costs $49.95 per year. With a standard setup, all files that you delete will be permanently removed from the moment you choose to get rid of them – although it can take up to 24 hours for your account to update the changes. If you’d like to have the option to view and restore your deleted files for 30 days, then you can buy access to the MyPCBackup Recycle Bin for $22.99 per year. MyPCBackup doesn’t mirror the contents of your hard drive (so if you delete a file from your computer, it won’t be removed from your Cloud storage too). As a result, you can choose to move files from your PC to your backup in order to free up extra space – although remember that keeping just one copy of a file has its risks! 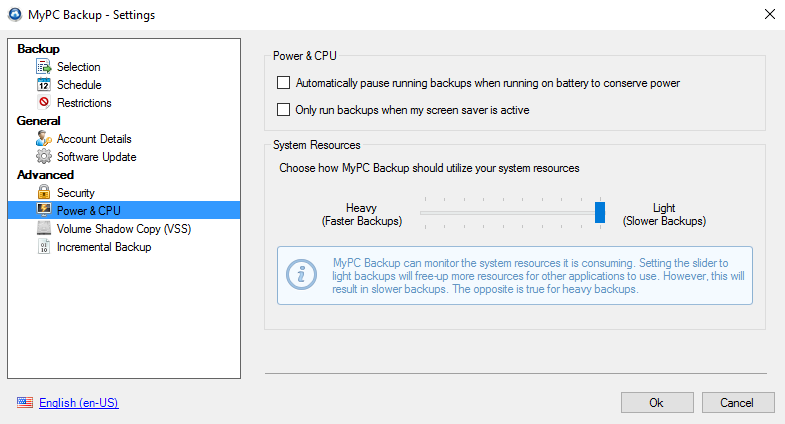 There are some impressive options for minimizing MyPCBackup’s impact on your computer’s normal processes, including the ability to only run backups while it’s in sleep mode, or set a personal a cap on the program’s CPU usage. You can also buy the Supercharged Backups add-on, which eliminates server traffic and lets you connect to a server that handless fewer processes; meaning that you won’t have to wait around so long for your file transfers to complete. It also further reduces MyPCBackup’s CPU usage, and will set you back $24.95 per year. If you’re an Ultimate user, there’s a risk that you’ll be requested to upgrade to a Business plan, or have your account closed if MyPCBackup deems you to be exceeding “normal” usage. Unfortunately, what qualifies as “normal” usage isn’t just determined by how much storage space or bandwidth you use – it’s subject to other factors as well. Exactly what these factors are isn’t clearly qualified anywhere on the MyPCBackup site – they really just seem to be targeting just anything that suggests you might be a business trying to save a bit of cash by masquerading as a personal user. It’s worth knowing this in advance if you’re planning to store a lot of data with MyPCBackup and, if necessary, contacting their support team to discuss whether your account might be at risk. If you’ve got a standard account and want to backup from a network drive or NAS, you can upload your files manually by clicking and dragging them to your MyPCBackup folder. This might not be ideal if you want to store a lot of data, as it can be pretty slow to select every file individually – alternatively, if you’d rather run the backups automatically, there’s an add-on for that. MyPCBackup’s Network Drive Support add-on will set you back $99.95 per year, and should make transferring files from your drive much quicker and easier. It’s not too difficult to set up, although the process of automatically uploading files from a network device is a little different to the standard approach. There’s a handy guide available on the MyPCBackup support page if you get stuck. Files stored with MyPCBackup are first encrypted for transfer, and then kept secure in the company’s data centers. While this is all good news, the fact remains that this encryption isn’t end-to-end – MyPCBackup set your encryption key themselves, meaning that they also have the information required to decode your data at any time. If you like the sound of MyPCBackup but want stronger security, then there are no restrictions on uploading files that you’ve encrypted in advance using third-party software. A Google search will quickly show you why we’re talking about this, as many people find MyPCBackup installed on their computer without having downloaded it themselves, and worry that it might be Malware. It’s also commonly flagged by Norton and other antivirus programs as a PUP (potentially unwanted program). Fortunately not – MyPCBackup only appears because it is bundled with other programs, and pops up during antivirus scans not because it poses any threat to your PC, but because Norton detects that you might not want the software to be there. While we appreciate that these things don’t paint MyPCBackup in the most flattering light, they do mean that there’s nothing malicious about the program and, therefore, no reason not to install the software if you decide that it’s the best choice for you. MyPCBackup’s Support pages offer a fairly extensive FAQ, covering topics from mobile apps to file sharing and canceling your account. There are also video tutorials on basic topics such as getting started and syncing files, which are informative – if a little dry. Somewhat confusingly, you can only contact MyPCBackup’s staff directly by navigating to the ‘Contact Us’ page of their main website, although everything’s straightforward enough once you get there. Both Technical and Billing departments can be reached by email 24/7, with billing support also getting phone lines around the world. Their website also recommends reaching the team by following @mypcbackuphelp on Twitter, although this is unlikely to get you very far today as no activity has been registered on the account since 2012. MyPCBackup run a 24/7 support service, with both phones and emails manned around the clock. Upon submitting an email inquiry, we were told that staff would aim to reply within two hours – and they delivered, getting back to us almost immediately. The employee that we spoke with first gave us a comprehensive and professional reply, but we were confused when a follow-up email from another staff member gave us conflicting information on the price of add-on services. It took several attempts for us to get full, up-to-date information, and it was clear that there was zero communication going on between different members of the support team. Speedy, then, but a little inconsistent. Getting setup with MyPCBackup is fairly straightforward – all you’ll need to do is register on their website (no payment details required unless you choose to upgrade to a paid subscription), and then download their desktop app. You’ll have the choice between starting your backup with Recommended or Advanced settings. Following the recommended setup will automatically upload your Documents, Videos, Music, Photos, Desktop and Downloads folders while the more advanced option will let you hand-pick the files that get backed up first. This can be very useful if you don’t want to store all of your files, or if you’re taking the software for a test run before committing to a paid plan. MyPCBackup’s desktop app is simple, making it easy to navigate to anything you might want to do (change settings, sync or restore your files, automatically or manually run uploads), although browsing through your files can only be done from your browser. It might not be the most stylish setup, but we’re confident that users without any technical know-how wouldn’t have any major problems. If you want to bring your MyPCBackup subscription to an end, you’ll need to email their cancelation department at cancel@Mypcbackup.com. They ask you to list the reasons for your decision in your initial email, after which they will either offer solutions (however unwanted) or proceed with the cancelation. So long as you don’t mind being a little pushy if they’re trying to make you stay, you shouldn’t encounter too many problems, although it may take a few messages before things are finalized. You can then uninstall the software from your computer as per usual. None – everything’s nice and simple. We’ve got mixed feelings about MyPCBackup – on one hand, charging for services that come free with almost all other backup providers is a big turn off, but on the other, their software is easy to use and they offer some useful features; all of which are very well-executed. Although we like a lot of what MyPCBackup has to offer, and the idea of cherry-picking only the features that you want to use has its appeal, charging for the privilege certainly doesn’t. For less money, we’d be recommending it wholeheartedly. As it stands, we’d say give it a try if you’re happy to splash out, but beware of all those hidden costs if you’re working on a budget. What do you think of MyPCBackup? Leave us a comment with your thoughts!